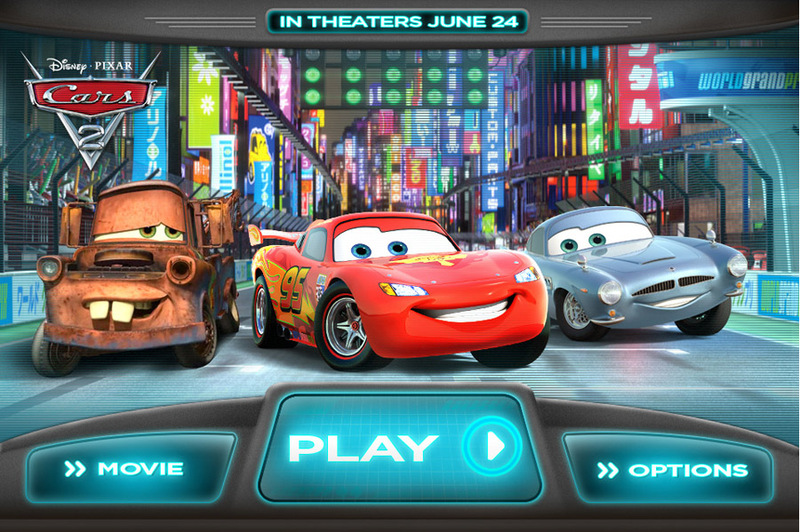 I'm enjoying this three-day holiday weekend by immersing myself in some digital doodads from the world of Cars 2. What? I should be outside enjoying myself? Swimming? Barbecuing? Naaaa. I gotta get to level five on Cars 2: The Video Game. Yes, I know there's a real world out there. I read about it on the Internet. Cars 2: The Video Game is a fun and surprisingly challenging racing game available on the major gaming platforms (PS3, Xbox 360, Wii, Nintendo DS, PC and Mac). I'm playing the Wii version and getting a kick out of the more than 20 Cars characters I can race as and against. The backstory of the game is you're a new secret agent training at C.H.R.O.M.E. (Command Headquarters for Recon Operations and Motorized Espionage), the international spy school from which Cars 2 characters Finn McMissile and Holly Shiftwell sprang. Your object is to advance through the spy ranks by completing various driving tests, from standard racing to battle racing (with your own arsenal of in-car weapons) to hunter challenges where you seek and destroy enemy cars on a closed course. There are also survival races where you must evade the heat ray of the evil Professor Z while doing some nifty precision driving and protecting your vehicle. If this all sounds a bit violent for little ones, Disney (with developer Avalanche Software) tries to lessen the impact by assuring players that they're all part of one big simulation inside the "Holodome" at C.H.R.O.M.E. For me, this doesn't change the fact that the most fun about the game is blowing stuff up. It's Split/Second meets Mario Kart. Master tricks like backwards and two-wheel driving and you can earn extra points and virtual badges (I've gotten quite good on two wheels; backwards driving, not so much). Finish in the top three of each event and you can move on to higher stages of the game, unlocking new tracks and vehicles as you go. Cars 2: The Video Game is for 1-4 players, ages six and up. It's available now from Amazon and most video game retailers. Cars 2: Agents of C.H.R.O.M.E. (for iPhone and iPod Touch) calls itself a side-scrolling racing game, but you're not really racing against anyone or anything, even time. What you are doing is collecting tokens while jumping over obstacles and navigating a series of ramps, platforms and skyhooks to earn points. 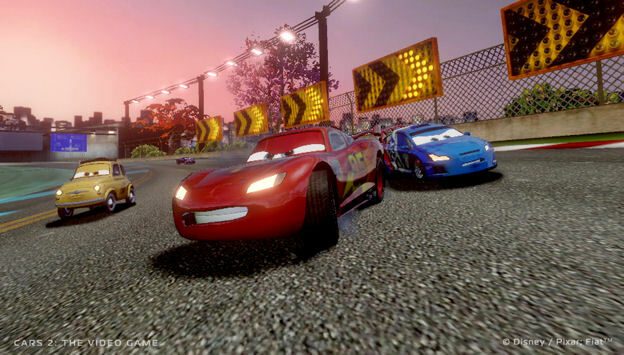 There are eight levels in each of three Cars 2 environments (Oil Rig, Tokyo, London) that are fairly easy to work through and you can play as either Lightning McQueen, Mater, Holly Shiftwell or Finn McMissile (although your choice of character doesn't alter the gameplay). For 99 cents at the App Store, it's a mildly diverting bit of Cars 2 fun for ages four and up. The Cars 2 Storybook Deluxe is the latest of Disney's digital books for the iPad. It's a condensed version of the movie's storyline, geared for kids, with attractive artwork and fun animation activated with a tap of the screen. Children and parents can follow along with the audio narration or turn it off and read at their own paces. You can record your own narration, but this is the one feature of the app that falls short. Since the microphone in the iPad (at least my first generation one) is not very powerful, your recorded voice is hard to hear over the story's music track, which cannot be muted. This pretty much defeats the purpose of recording your own voice. Note to developers: add an off switch or volume control to the music and we'll be good to go. The Cars 2 Storybook Deluxe also comes with five digital coloring pages, five puzzles and two in-app games. It's currently selling for $5.99 in the App Store.